Welcome to the Winter and School League (WIOL) Series! These concurrent and popular series run from November through February. The Winter Series is open to all, while WIOL (Washington Interscholastic Orienteering League) is designed for students from Elementary-age through High School. Events in the first half of the season are held in beginner-friendly venues, some of which are trails-only, while events in the second half move to more forested and challenging venues. The season is capped off with a championship event and an awards ceremony to recognize top participants and school teams in both the series overall and championship event. As with all of CascadeOC’s series events, while it is fun to participate in the entire series, it is not required. Each event is a stand-alone event and open to all! Register for WINTER SERIES (open to both kids and adults) at the link below or at the event! 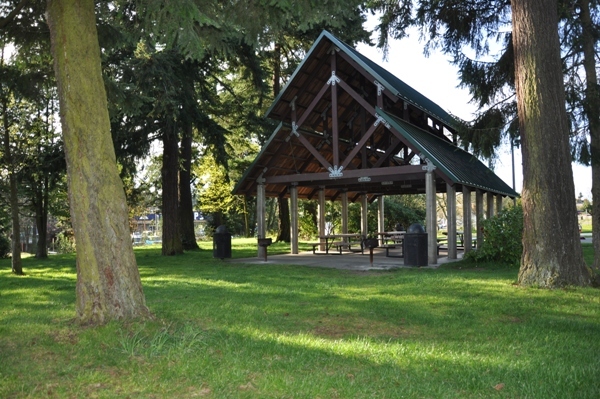 Open park to the North, recaptured/overgrown urban area to the South, welcome to North SeaTac Park. The north end of the park is relatively flat while the southern area has more significant vertical development. Please pay attention to out of bounds areas (marked on your maps) including soccer fields to the north, maintenance facilities in the central and south areas of the park as well as the Highline SeaTac Botanical Gardens. Please pay attention to out of bounds areas (marked on your maps) including soccer fields to the north, maintenance facilities in the central and south areas of the park as well as the Highline SeaTac Botanical Gardens. -JV Boys South and JV Girls/Intermediate have a guided route between two soccer fields. You may go around but DON’T cut across the North Soccer fields, even if there is no one playing! This would give those who can’t a disadvantage!! -Varsity, Short and Long Advanced have a mandatory crossing point at the SW corner of the SeaTac Maintenance Facility to get across South 136th Street. Note: these directions are to the north parking lot. Some events use the south parking lot off of S 136th St. Check the event page to confirm the parking location. Follow the parking signs to the lot on the east side of the park. North SeaTac Park is a unique park–an answer to the question, “What would happen if all the people and their houses disappeared from a neighborhood?” There’s a mostly intact grid system of overgrown streets, trees and other vegetation that have grown back withe a vengeance, and open, grassy areas with intermittent vegetation clusters that are easy to navigate through if you don’t make a parallel feature error. We typically start from the northeast area of the park, where there is ample parking and permanent restrooms. There is one busy street mid-course (on the longer courses), which usually has a crossing guard as a volunteer role.